Helen and I went out with NUKB yesterday on an early bird run up to Hartside Cafe. We met up with all the Lancashire guys at Clitheroe Services for 7:00am. 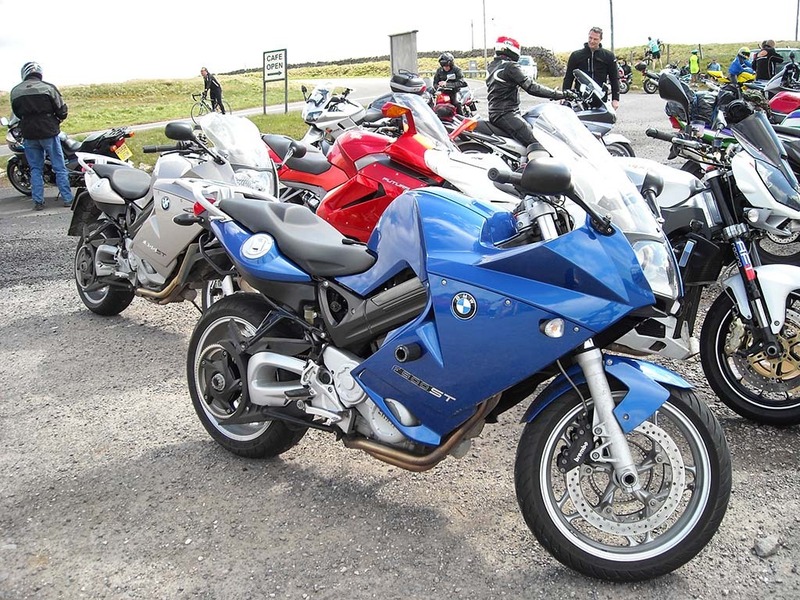 Scotsy had organised the route and was rideout leader. 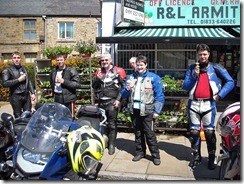 We set off from Clitheroe up the A59 heading towards Skipton. We soon turned off the A59 and headed through Sawley to Wigglesworth. In Wigglesworth we took the B6478 to Long Preston, in Long Preston the Police had closed off A65 heading towards Ingleton. However we turned right here and took the A65 towards Gargrave. 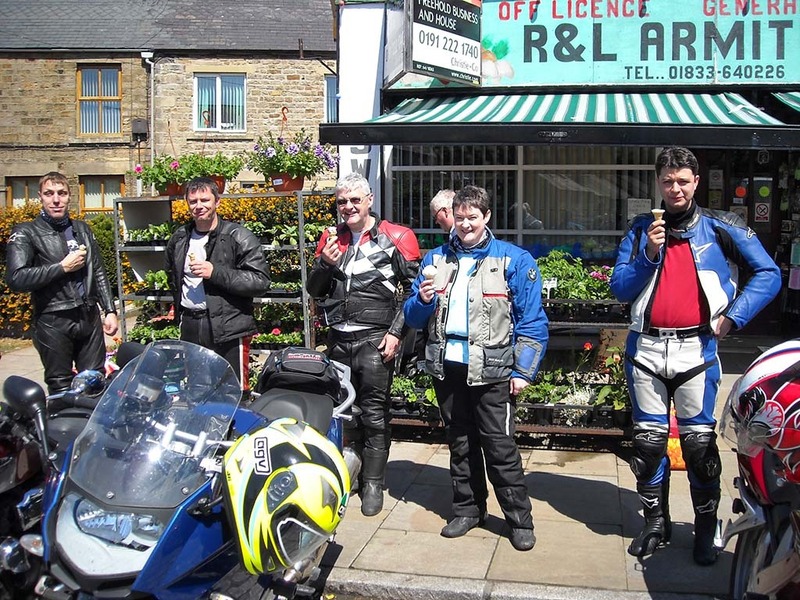 We turned off the A65 at Hellifield and met up with some of the Yorkshire Guys. We left Hellifield on minor roads and headed through Otterburn and turned left in Airton and headed towards Kirkby Malham. We stopped in Malham for a quick comfort break and then headed round Malham Tarn over West Moor to Arncliffe. We turned right in Arncliffe and continued along this road until we met the B6160 and then turned left towards Kettlewell. We went through Kettlewell and then turned left onto minor roads at Buckden. We proceeded through Hubberholme and Deepdale before going over Oughtershaw Moss and down into Hawes, where we stopped for a brew. We left Hawes and then went over Buttertubs Pass to Thwaite. Just after Keld we turned right off the B6270 and headed up the double hairpin bends and over Stonesdale Moor to Tan Hill. At Tan Hill we turned left and headed over to join the A66 near Maiden Castle. We continued along the A66 and eventually turned off near Temple Sowerby and took the B6412 to Culgaith. From there we joined minor roads and went through Skirwith and Ousby to join the A686 at Melmerby. 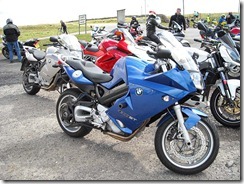 We then went up the A686 which was slightly spoiled by traffic and stopped at Hartside Cafe for lunch. 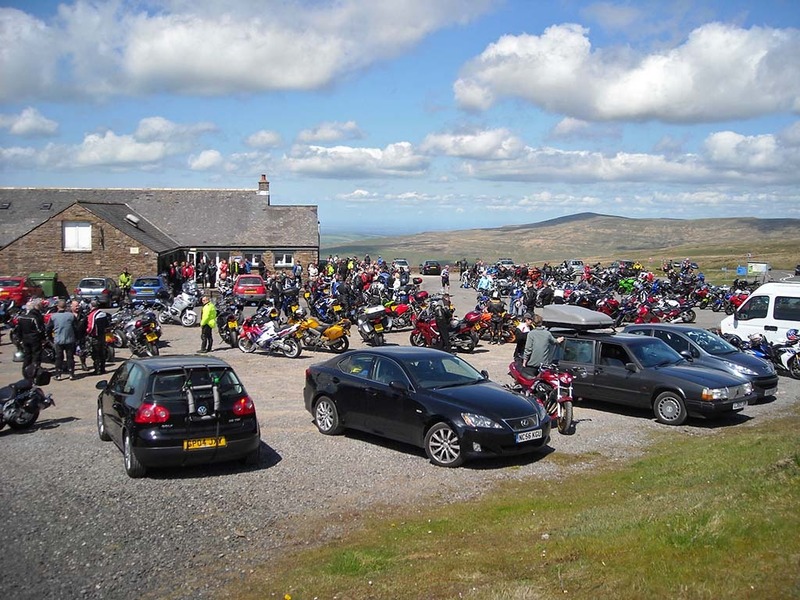 We left a very busy Hartside Cafe and headed on the A686 to Alston. We took it easy as we had already been warned that a safety camera van was down the road towards Alston. We filled up at Alston then turned right and took the fabulous and often deserted B6277 to Middleton-in-Teesdale. We stopped in Middleton for some much needed ice creams and then said a fond farewell to the Yorkies. We then took the equally deserted and fabulous B6276 to Brough. From Brough we took the A685 to Kirkby Stephen. In Kirkby Stephen Scotsy relinquished the lead and I then lead the group down the A685 and soon turned left and took the very fast A683 to Sedbergh, on the way we passed another safety camera van. In Sedbergh we continued on the A683 down to a very busy Devils Bridge. We only stopped from a short while for a comfort break, it was far too busy. We left Devils Bridge with DocB now taking up the lead. We continued down the A683 heading towards Melling and Hornby. We continued past Caton on the A683 and once past Caton turned left towards Quernmore. At the crossroads in Quernmore we turned left and headed for the Trough of Bowland. We pasted through a very busy Trough and turned left at the end of the road at Dunsop Bridge. We continued down this road and then turned right at Newton onto the B6478. We went over Newton Fells through Waddington and into Clitheroe. We stopped at Clitheroe Services again and visit McDonalds for a much needed drink. After a brief break we said our goodbyes and proceeded home arriving back at around 5:00pm after a wonderful 277 miles round trip.